We’ve been thinking a lot about oaks recently. For one thing, it’s the time of year when the big coast live oak sheltering our bedroom bounces acorns off the roof during the night. For another, public outcry over the proposal to cut down 4,000 or so oaks on the former Ft. Ord in order to build a bus yard and business park on previously undeveloped land (rather than on the many acres of abandoned buildings and parking lots right next door) has brought oaks, at least temporarily, the kind of attention people normally reserve for redwoods. 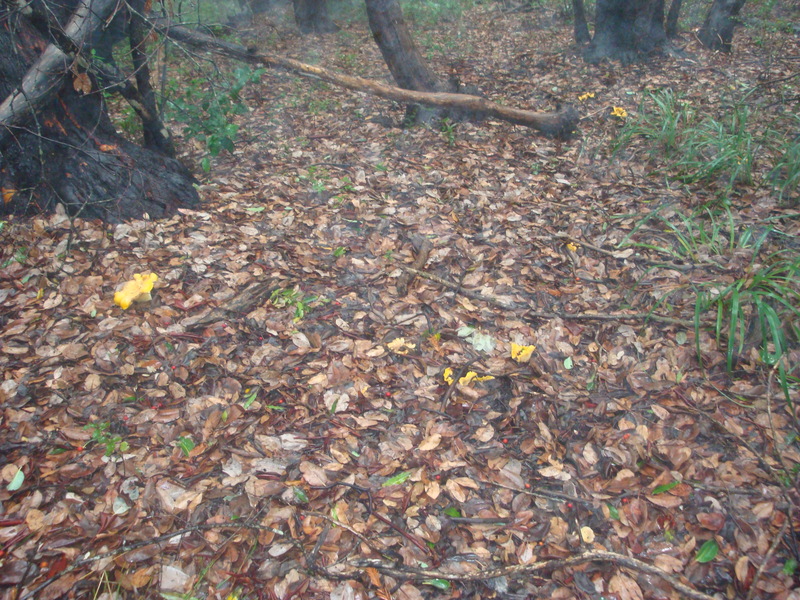 And finally, comes a report from the UC Berkeley Forest Pathology and Mycology Lab that Phytophthora ramorum infection – better known as Sudden Oak Death – is much more widespread than previously thought. 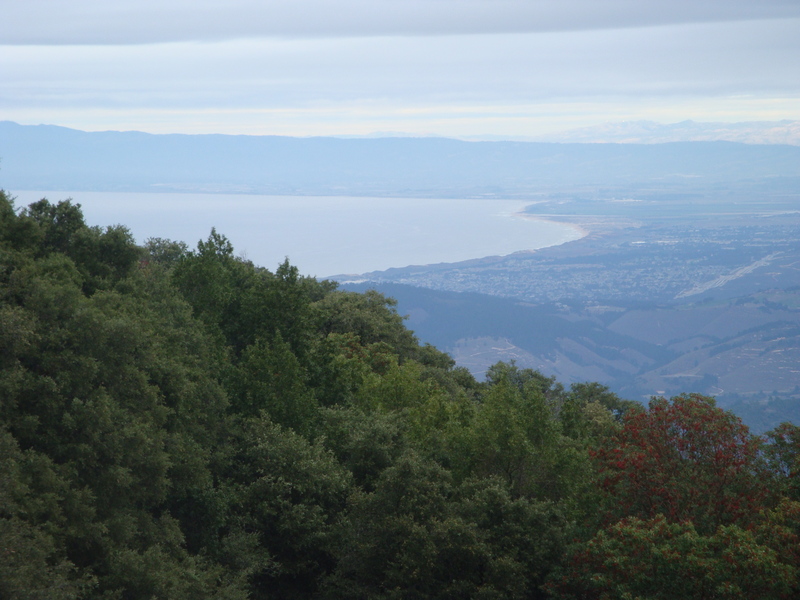 A mixed forest overlooks Monterey Bay from the northern fringes of the Santa Lucia Mountains. Below the canopy. Oak and madroño. 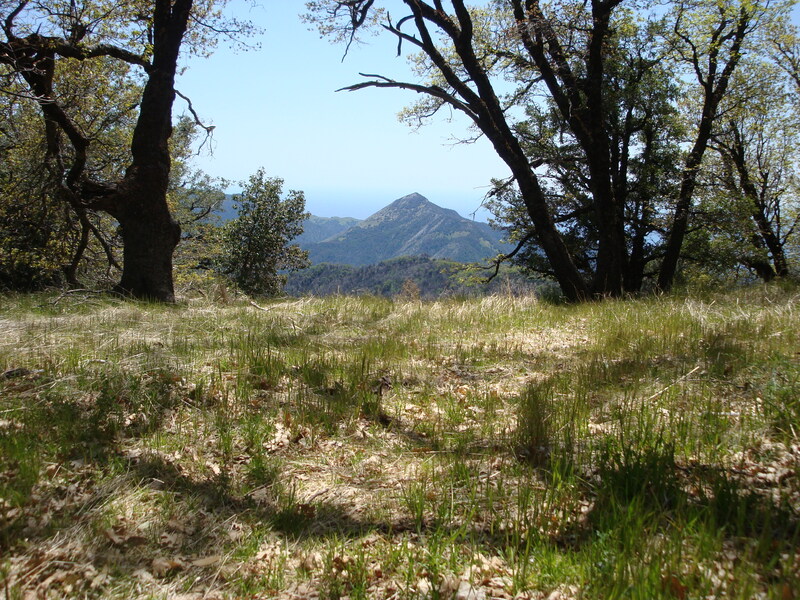 It’s not news that California’s oak savannas, woodlands and forests are shrinking. 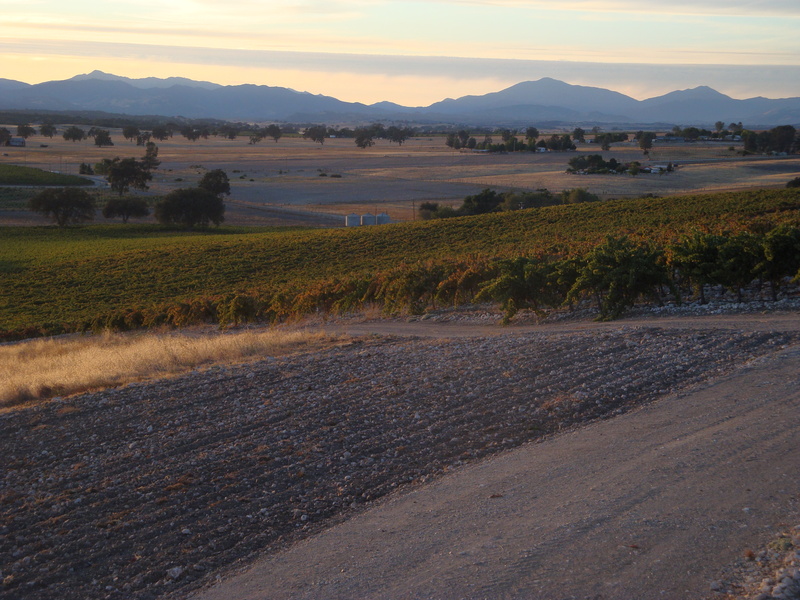 Most of the magnificent valley oak savannas of the Central Valley and Southern Salinas Valley were cleared for agriculture long ago. The hilly oak woodlands at the margins of valleys have become a favored habitat for sprawling subdivisions, and the denser oak forests of the coast, also subject to intense development pressure, now face the specter of massive Sudden Oak Death mortality. Some of the state’s healthiest remaining valley oak (Quercus lobata) savanna can be found in the San Antonio Valley. Cone Peak, Pimkolam and Pinyon Peak along the skyline. 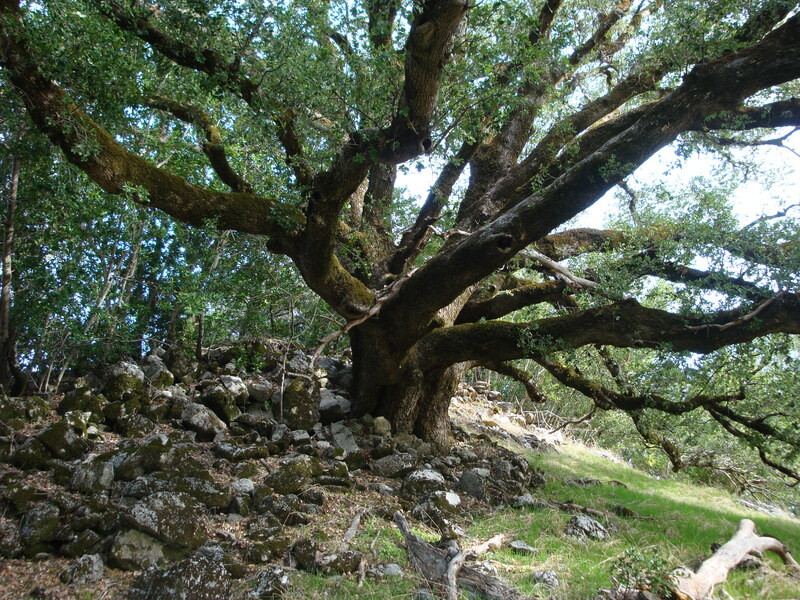 A canyon oak (Quercus chrysolepis) deeply rooted in rocky Santa Lucia soil. Estimates of how much California oak habitat has already been lost range from half to two-thirds, with an additional 30,000 acres being converted to residential or commercial uses every year – although the bad economy has likely slowed this loss. Fragmentation of habitat, as when human development removes all but a scattering of decorative landmark oaks, can doom an oak woodland to extinction. Oaks depend on wind pollination and are unable to reproduce unless there are other oaks within 1,000 feet. Competition with non-native grasses and increased pressure from deer, gopher and other mammal populations, in areas where humans have killed or driven off predators, can also negatively affect oak reproduction. 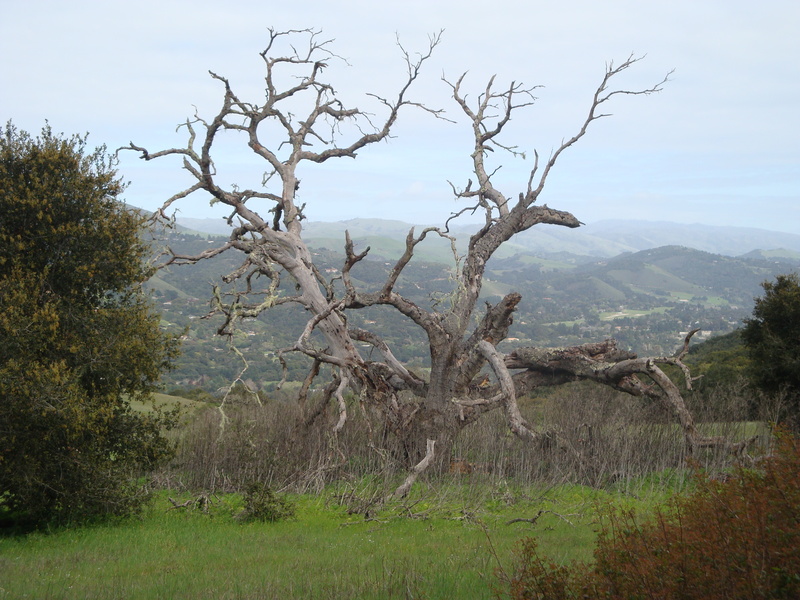 Dead Oak overlooking Carmel Valley. Canyon Oak catkins. 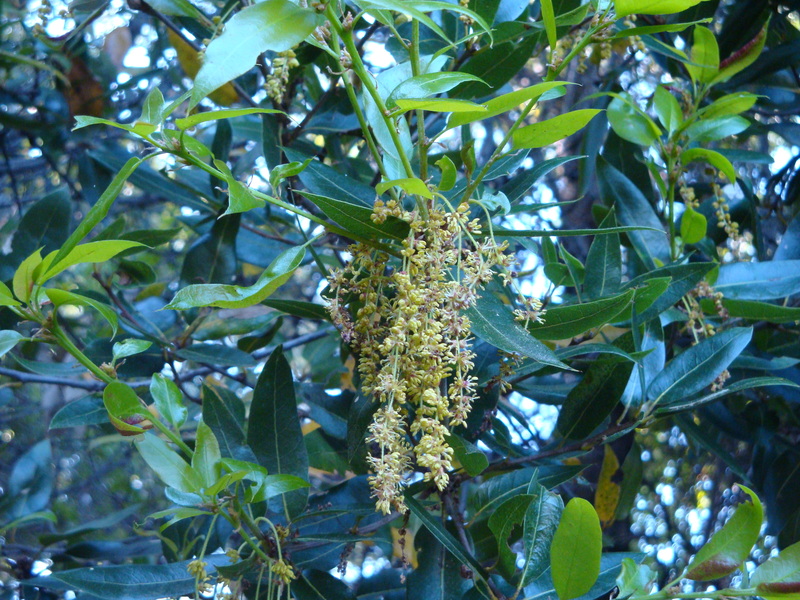 The oaks rely on the wind to blow their pollen into the surrounding forest. 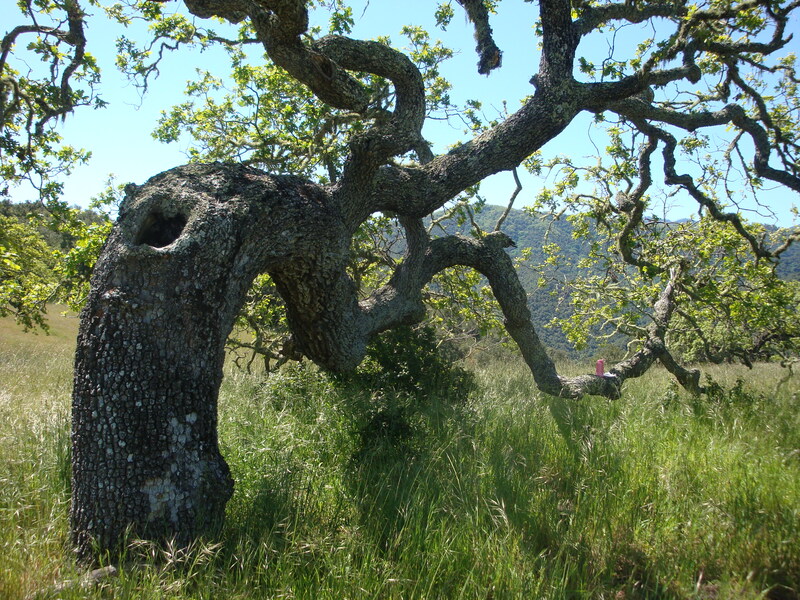 Tanoaks (which are not a true oak at all, but reside in the genus Lithocarpus) and coast live oaks are the two species most clearly threatened by Sudden Oak Death. 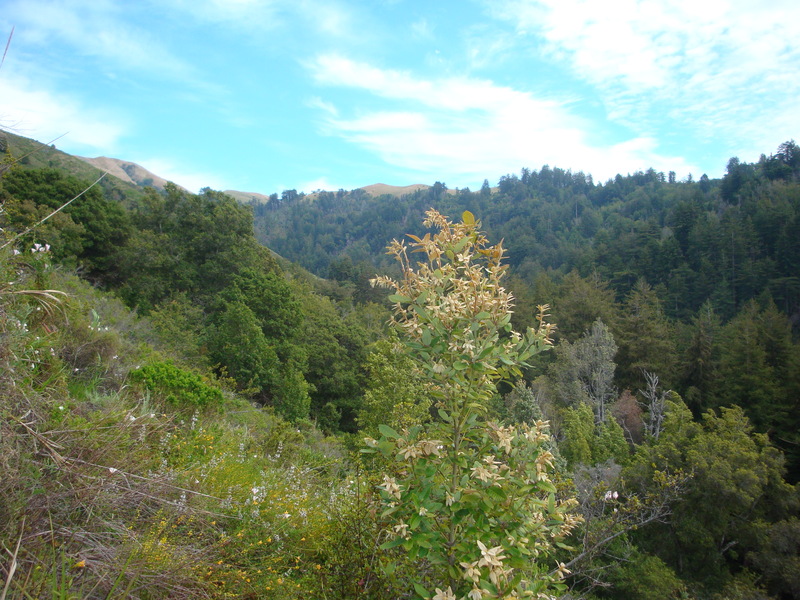 Most of the tanoaks in the canyons along the Big Sur coast have already died of Sudden Oak Death, and dead tanoaks helped fuel the 2008 Basin Complex Fire in some areas. Coast live oaks have not yet died in such large numbers, but there is concern that their mortality rates may eventually be similarly devastating. 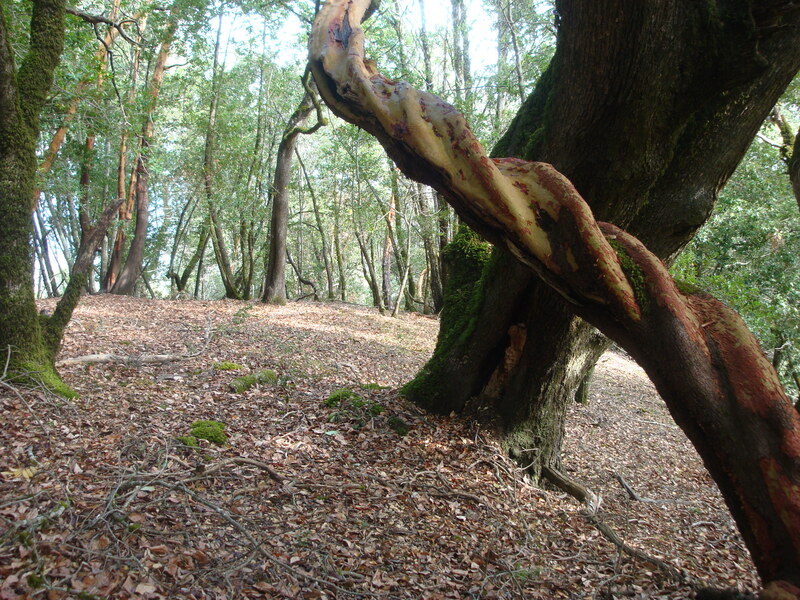 Sudden Oak Death infects many other plants and trees less seriously (most notably bay laurels, which may have played an important role in spreading the infection through the tanoak forests), creating a leaf blight that is rarely fatal. The Sudden Oak Death pathogen is in the same genus (Phytophthora) as the blight responsible for the Irish potato famine (Phytophthora infestans). 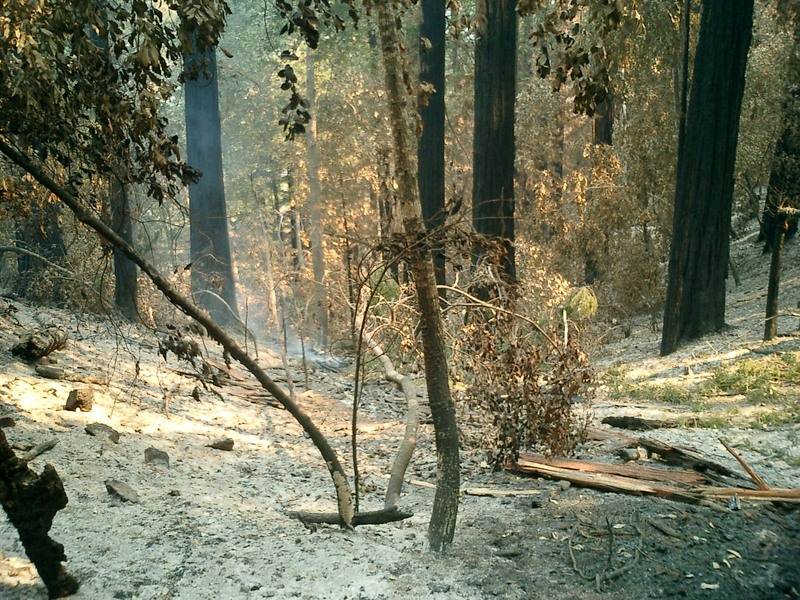 A redwood forest with an understory of tan oak smolders after the passage of the Basin Complex Fire. Following the fire, new tanoaks sprouted in large numbers. It remains to be seen whether enough of these will prove resistant to Sudden Oak Death to replace the lost tanoak forests. 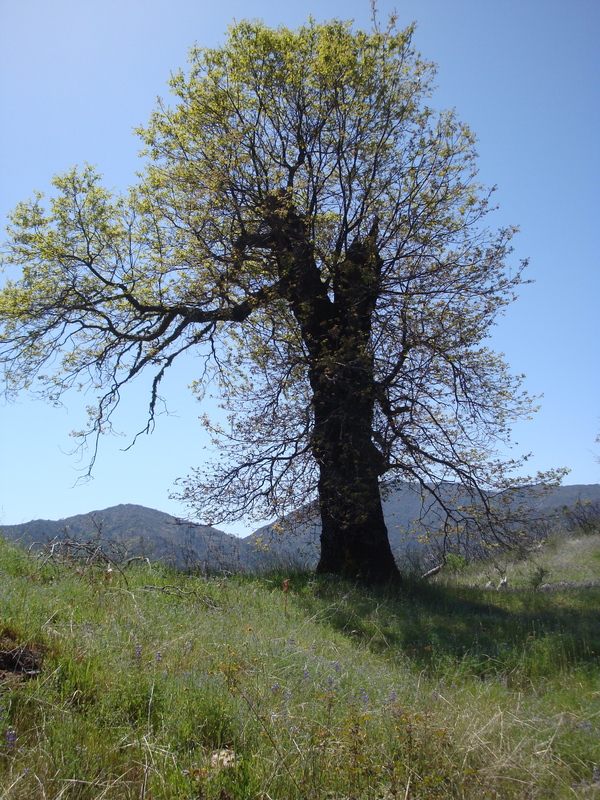 Depending on who you talk to, there are more than 20 species of oak in California or as few as one species. The problem with splitting oaks into clearly defined species is that they can be highly adaptable (as when coast live oaks in drier spots mimic scrub oaks or interior oaks), and that certain oaks hybridize with one another in the wild (sometimes resulting in forests more hybrid than “pure”). 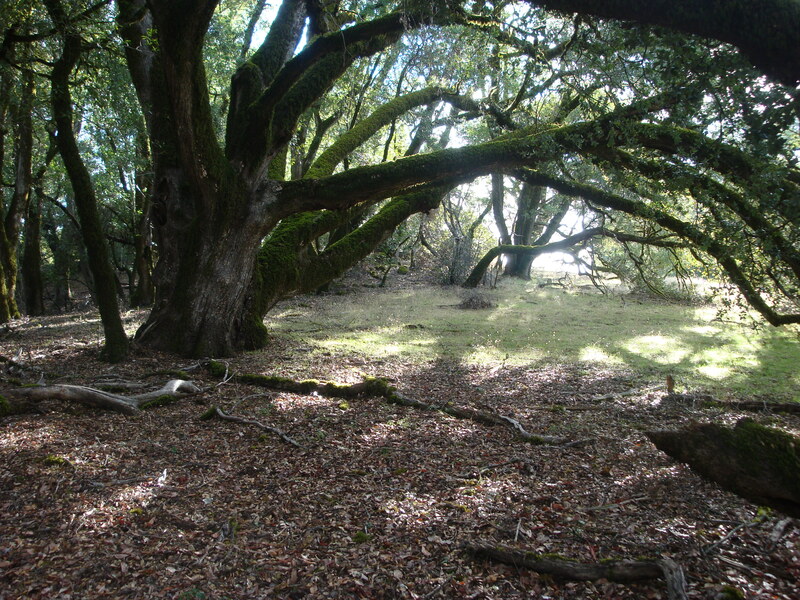 To make this more complicated, some of the oaks that hybridize with one another seem like less likely partners (as when evergreen coast live oaks, whose acorns ripen in a single year, hybridize with deciduous black oaks, whose acorns take two years to ripen) than some that don’t hybridize. The bottom line is that oak “species” tend to have various varieties and exceptions, and arguments over which varieties are really separate species and which species are really the same seem destined to go on forever. If oaks were a fungus, the mycologists would probably just draw a circle around them and call them a “species complex.” Maybe that’s not allowed in botany. A mixed forest with both deciduous and evergreen oaks in the Finch Creek drainage. Chew’s Ridge in the background. A blue oak (Quercus douglasii) in Carmel Valley’s Garland Park. 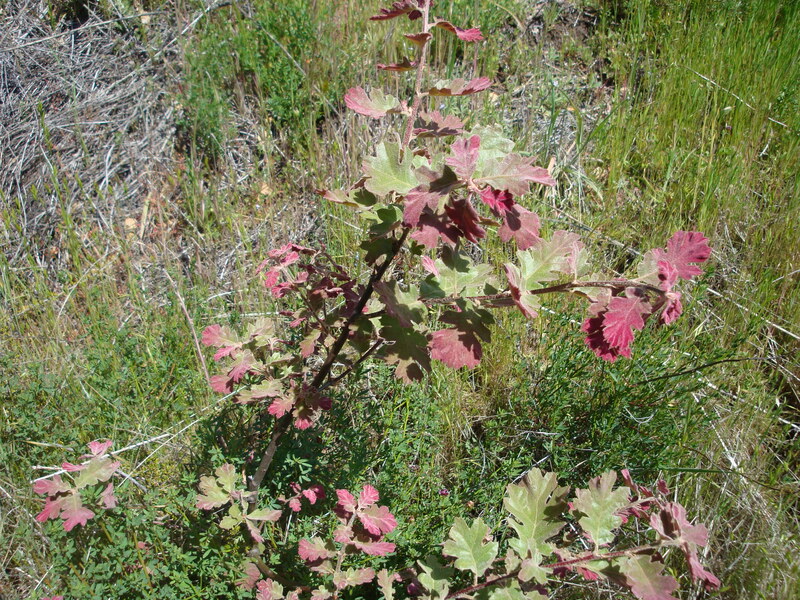 Oaks make life possible for myriads of other plants and animals by lifting huge quantities of water from deep underground during California’s long hot summers. When everything else goes dry, the moist soil beneath the oaks becomes an oasis. For thousands of years oaks played a central role in human society in California. It’s remarkable and unfortunate how quickly that long history has been put out of mind. It’s been only a little over 200 years since pretty much everyone in California ate acorns pretty much every day. Acorn soup, acorn mush, acorn bread … from the Sierra to the sea, acorns were the staff of life. Acorns have the advantage of being more nutritious than other human staples, like wheat, rice and corn and, better still, grow in vast quantities without need for human intervention or toil. Harvesting them is so easy that families often collected a year’s supply in less than a week. Black oak and tanoak acorns were especially prized, giving the people of the Santa Lucia Mountains a valuable export commodity. Black oak leaves are at least as colorful when they first leaf out in the spring as when they turn in the fall. 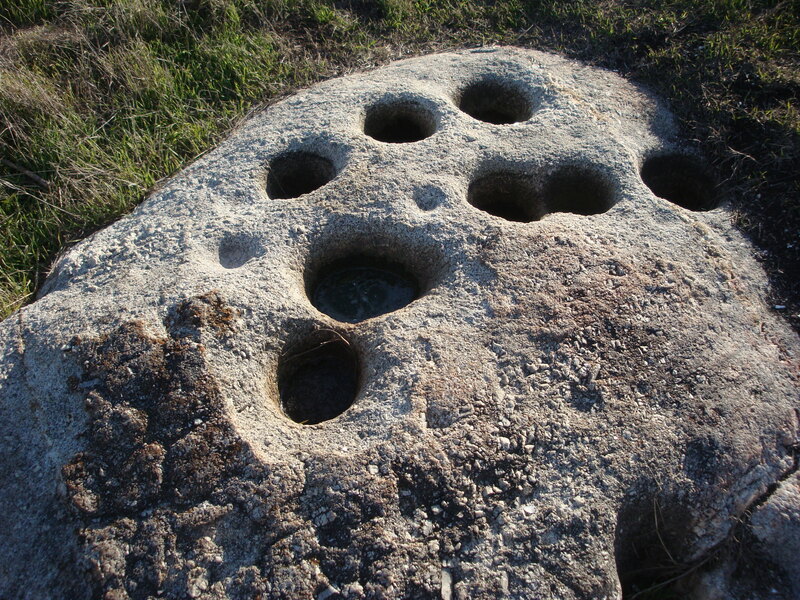 Heavily used acorn grinding rock near San Jose Creek; possibly associated with the Rumsen settlement of Ichxenta-Ruc. How many generations of women pounded their acorns here? The ability of the oaks to convert California’s sun, soil and water into such a vast supply of easily accessible food made them, and still makes them, the foundation of multiple food chains and gives them a central and irreplaceable role in California’s web of life. Acorns are an important food source for deer and many other animals. Chanterelles: another excellent food that needs undisturbed oak habitat to grow. Even dead oaks continue to produce delicious food. 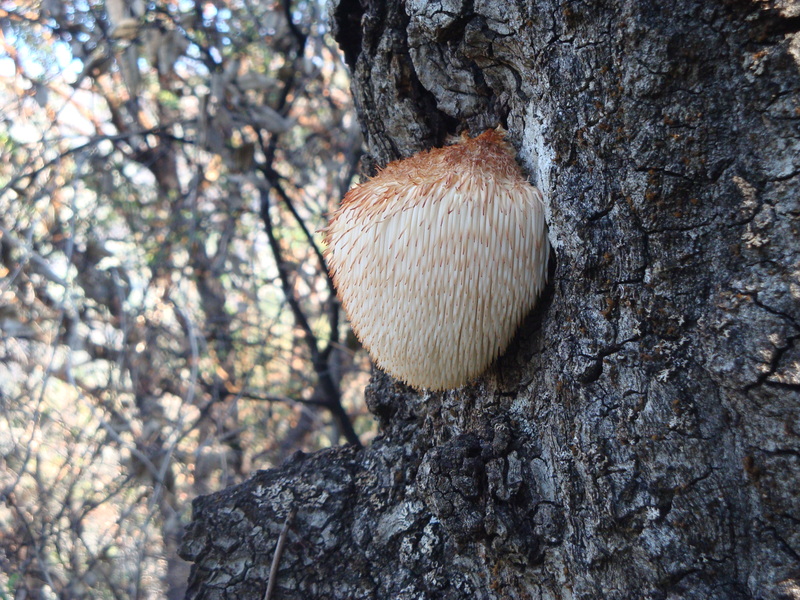 Lion’s Mane (Hericium erinaceus) growing from a dead coast live oak. So the oaks, we think, are due a little more respect than they’ve been getting for the past couple hundred years. Let’s hope their famous adaptability is up to the task of adjusting to the mess we’re making of the landscape and climate … And how about we stop treating them, and the web of life that depends on them, as though they don’t matter? 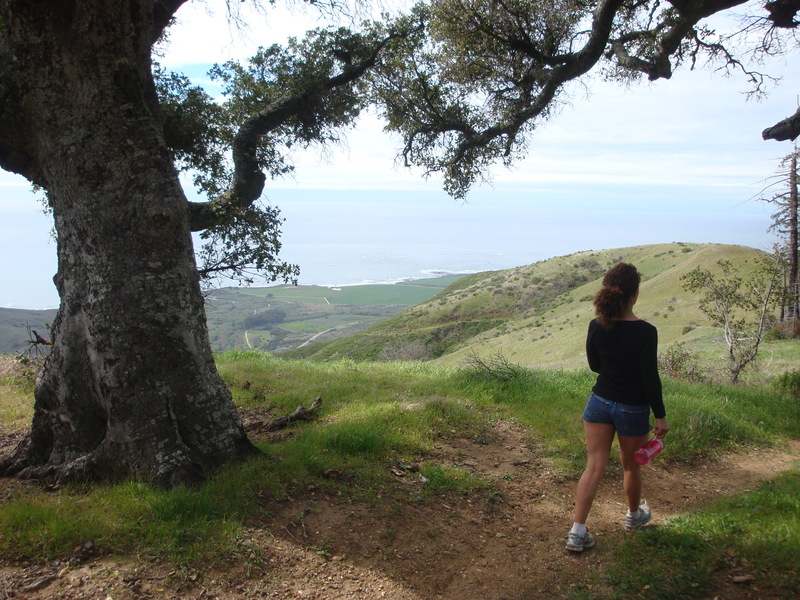 This entry was posted on Wednesday, October 12th, 2011 at 4:37 pm and is filed under Big Sur, Fungus, History, Plants, Santa Lucias. You can follow any responses to this entry through the RSS 2.0 feed. You can leave a response, or trackback from your own site. Lovely piece, as usual. As someone with some celtic in her and a veteran of 5 years of grade school Latin, I loved hearing the origins of quercus. The quiet durability of our local oaks is impressive: almost 30 years ago a fire swept through the manzanita and oak to the south of our house in the Santa Cruz Mountains. After the fire, acacias (Acacia dealbata), a local weed, quickly colonized the burned area. The manzanitas gave up the ghost long ago but the oaks still persevere; when I cut down and clear out the acacias, the oaks reawaken and go about their slow business with a surprising vigor. We’ve had a small grove of tanoaks that succumbed to SOD a couple of years ago. There’s now a thriving bunch of shoots emerging from the stumps, which I’ve been thinning. It will be interesting to see what becomes of them. Nicely done, as usual, XT. I always learn something when I read your blog. The Quercus lobata have always been the grandmothers, to me. 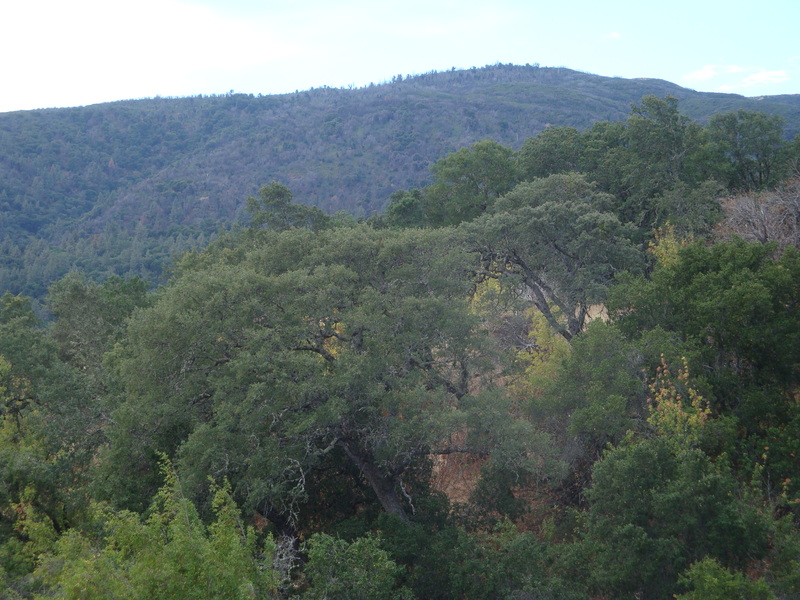 Jeff Norman, on a visit to my place years ago, told me that the two live oaks – canyon and coast – had hybridized up on my place, and I have huge old lobatas at 3272′, a high altitude for these “valley” oaks. Ah, yes, the sound of the acorns dropping in the fall. I am working on some interpretive panels on oak woodlands for a small non-profit group in Mariposa. 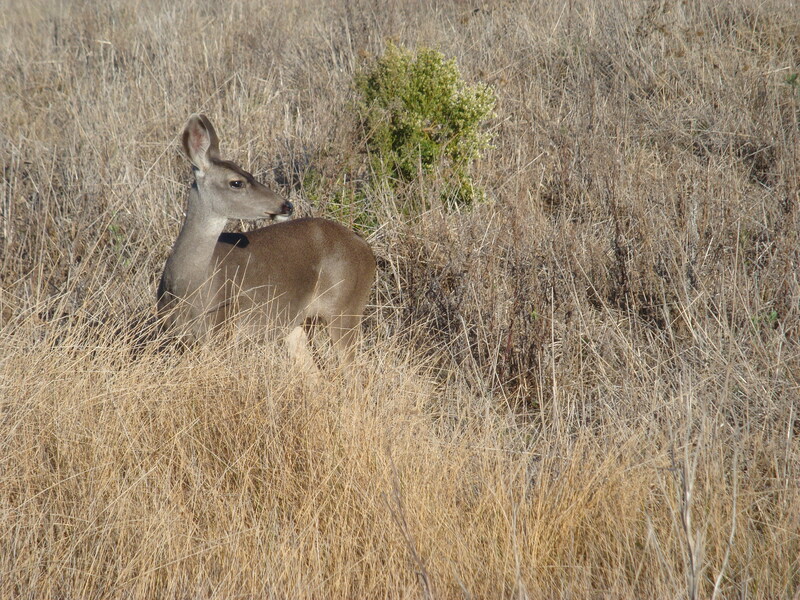 I was wondering if you might allow us to use one of your photographs (mule deer standing in dry grass)? We would naturally credit your photo. I am working on “illustrating” a children’s book for a class project. The author is a third grade science teacher who wants to use the book to explain the how the oak is a giver of life, and that fire is not a bad thing. Beyond our use for our classes he have no immediate plans of publishing the book—if that changes we’ll contact you again. For the meantime, given your blessing, we would like to use any or all of the following pictures in the series #8,9,11,12,13,14.